Ralph Vaughan Williams' Fantasia on a Theme by Thomas Tallis is one of his best known works, and Tudor church music was a major influence on the composer. During 2008 I am playing all the Vaughan Williams symphonies on my Future Radio programme, and this Sunday (Feb 17) it is the turn of the Eighth Symphony. This for many, including me, is one of his finest works, and it certainly destroys the myth of the composer as a backward looking English pastoralist, with its scoring for vibraphone, xylophone, tubular bells, glockenspiel and three tuned gongs. I'm coupling all the Vaughan Williams Symphonies with choral music from Thomas Tallis. 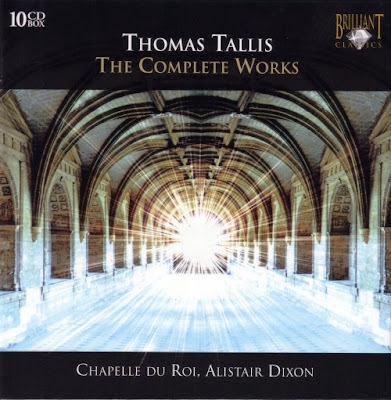 This will be taken from the splendid new 10CD box of Tallis' complete works at bargain price from Brilliant Classics sung by the Chapelle du Roi directed by Alistair Dixon. Tallis also composed a number of instrumental works which are included in the box. They are not of the same peerless quality as his choral works, but are, nevertheless well worth hearing. I paid £30 for the boxed set (texts included on CD-ROM) from an independent record store, but they are available cheaper online. Which rather captures the current lunacy of the classical music industry. The last of the ten Tallis CDs was recorded by Signum in 2004, and they were selling individually last year for £15. Cue columns of plainsong soaring upwards. I swung by an independent while passing through Vienna and have the same box laughing at me. Question is - what's more environmentally friendly - going to an independent store, by anything else than on foot, or ordering it online? I DARE you to broadcast Brilliant's complete Mozart (and as I said before, it's not complete!). One very interesting but rarely heard Tallis-inspired works is an early Orff orchestral work that is a Fantasia on a theme by Tallis as well. It requires, ironically, quite a huge orchestra, which if memory serves me correct, is split into two (or more?) ensembles. Hermann Scherchen recorded it for WESTMINSTER, but I don't think anybody else has, which is a great pity.